I was a Sentinels member. The strongest party of heroes, that Earth has ever seen. But then our reality was torn apart, and while all my colleagues and buddies went one way, I found myself in a new line. Quite alone, I must now find other partners and face a new threat at their side. 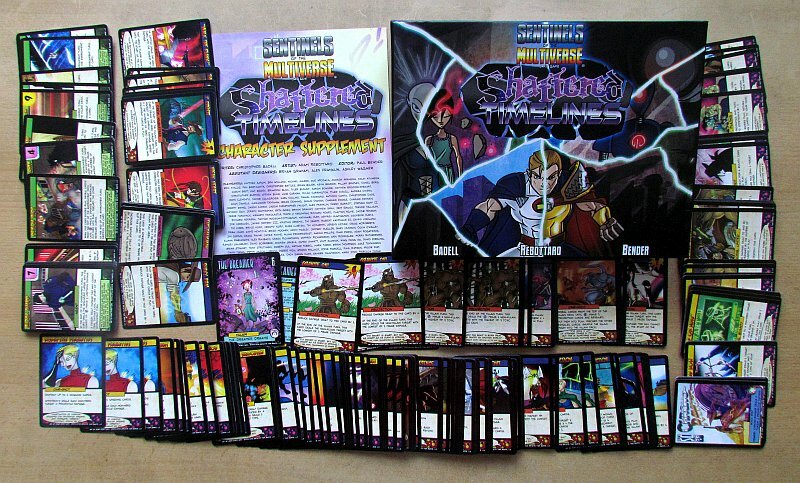 A new box full of heroes and villains is called Shattered Timelines this time, and it is an expansion for the popular Sentinels of the Multiverse game. 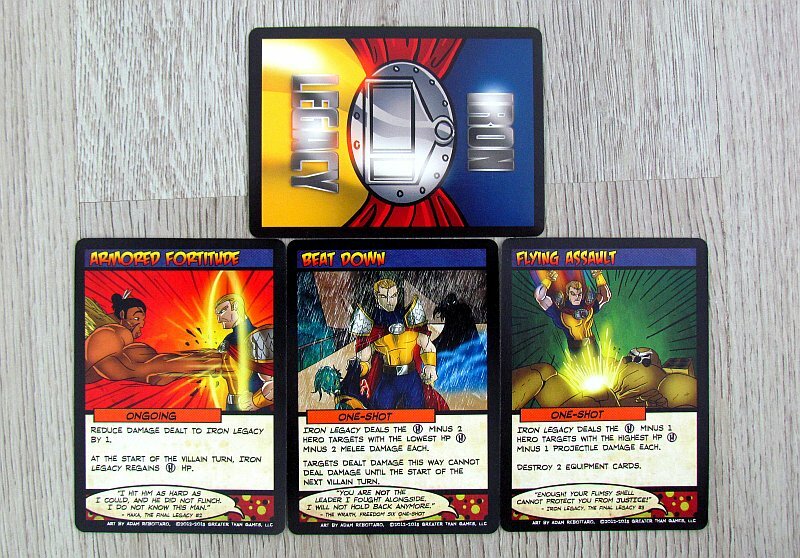 The creation of this box with several heroes, but especially the optically torn lid, was finished by three authors – Christopher Badell, Adam Rebottaro and Paul Bender. This is a box from year 2013, that was published by Greater Than Games. This pack contains three decks to start with. In fact, there are more of them, once you set them free from their plastic prison. Because the players will find two heroes and four bad guys inside. And the warriors on the good side are really interesting, because they both have something to do with time. 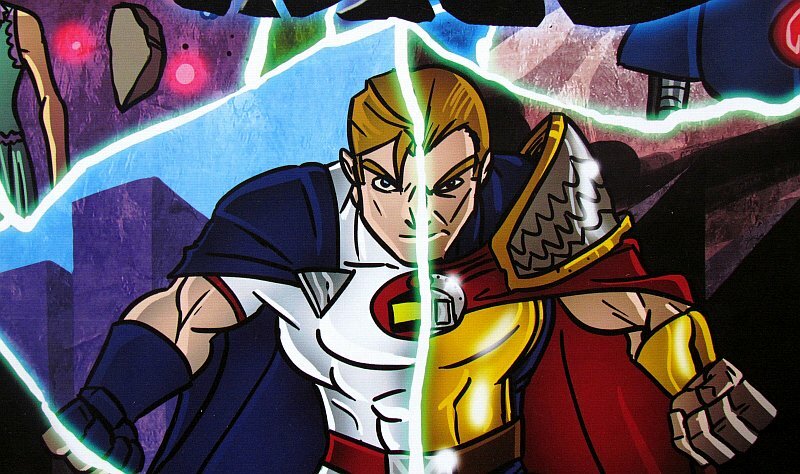 The first of the heroes is Omnitron-X. And as he is manipulating time, he allows different magic to be done with cards. But there are, of course, chances of attacking dangerous bad guys. 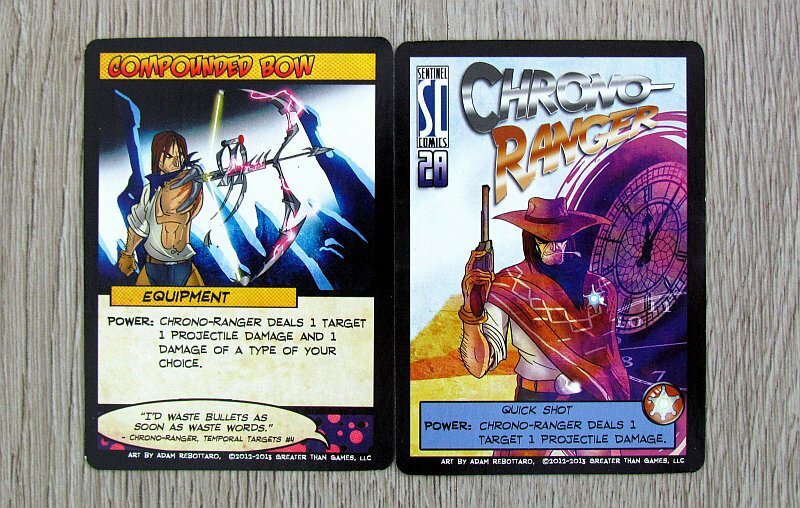 Cowboy named Chrono-Ranger will also stand alongside the one-eyed robot. Its important weapon is time colts, which can influence decks or hurt the bad guys. Interesting moments are, for example, the Hunter and Hunted cards, which increase injuries of the colts, but also make the ranger more vulnerable. Both fighters of good are a great achievement and help for your team. 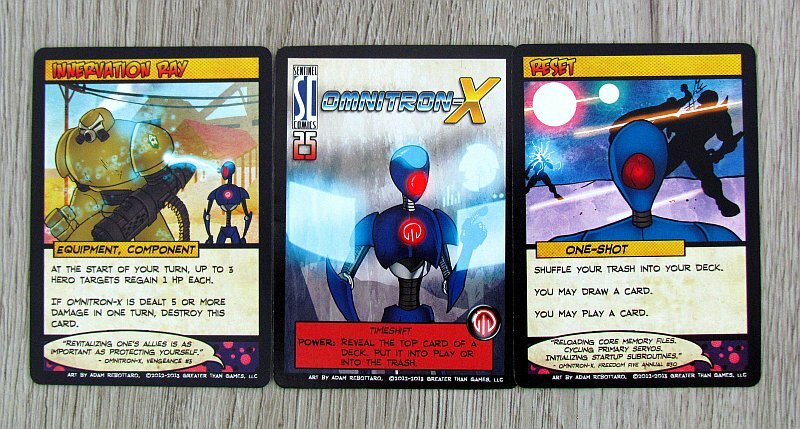 They are balanced in terms of contents of their deck, offering a fun and meaningful strategy while being both new and interesting. 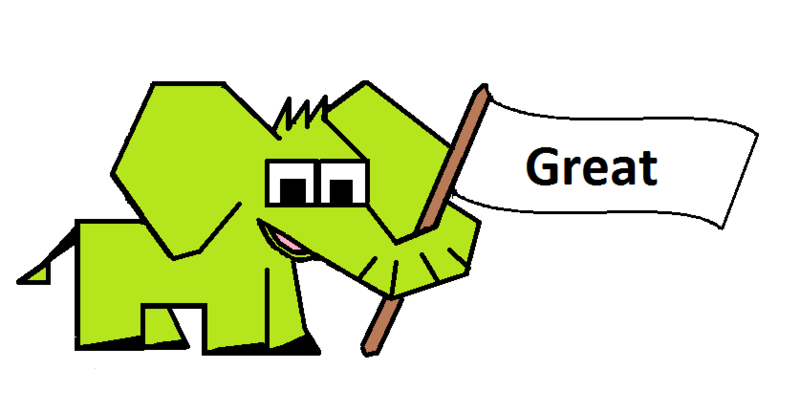 Additionally, excellent comic graphics is added. Bad guys are a real challenge. They all have two forms between which they switch. The Dreamer is really tough. 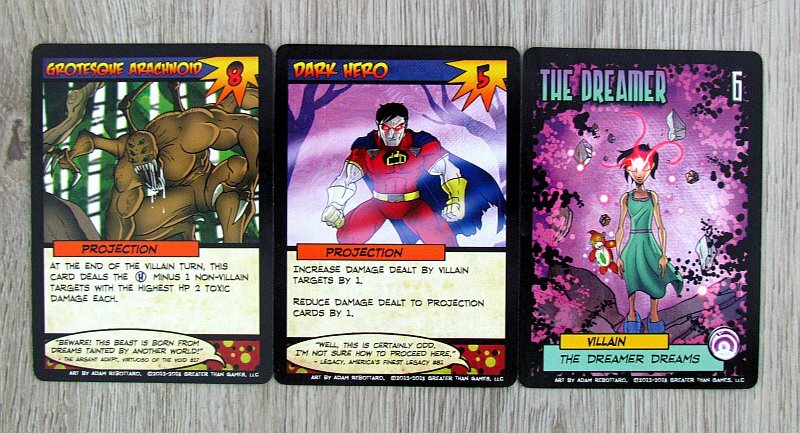 A dreamer, who has joined others, who want to take control of the world can destroy player cards. Moreover, the destruction of this dreamy girl is not easy at all. There are even three women here. 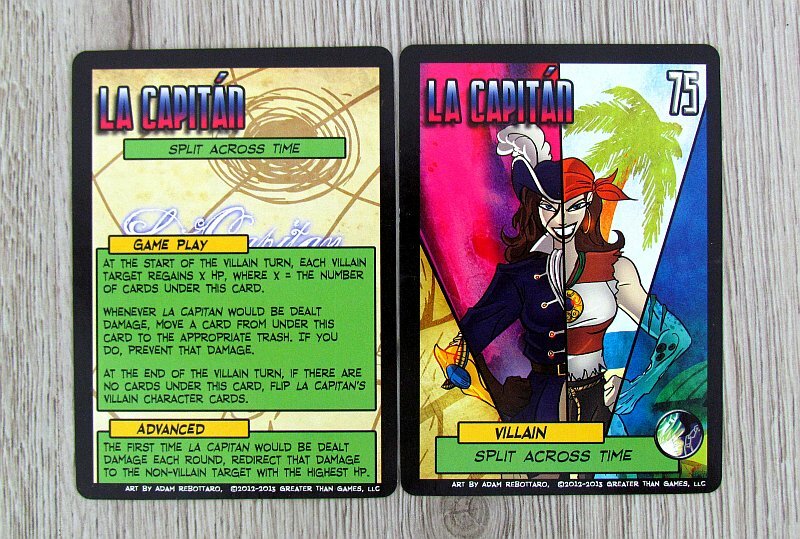 La Capitan is a bad girl, that can divide herself over time, allowing her to heal her fellow fighters. 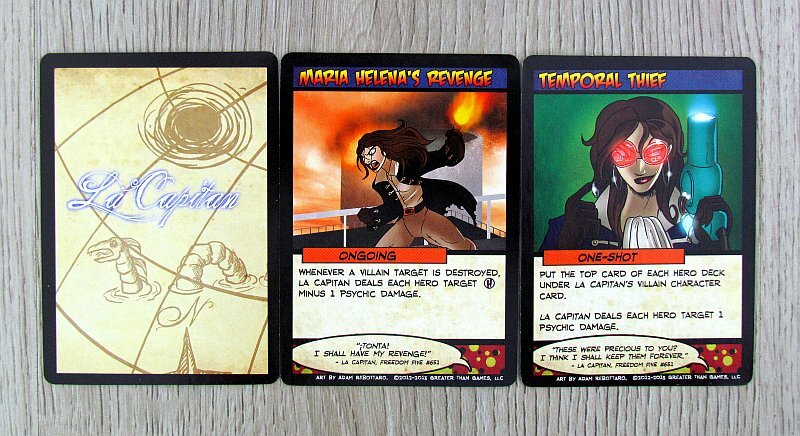 Below her character card are added cards, that make it hard to wound. And that is a fine example of how warriors of evil are more complex in rules. This, however, disturbs the overall impression of simplicity and fluency. But at the same time, there is a challenge. There are plenty of Xs to add player numbers to. This is, of course, absolutely essential for the game to be balanced across all possible numbers of participants. 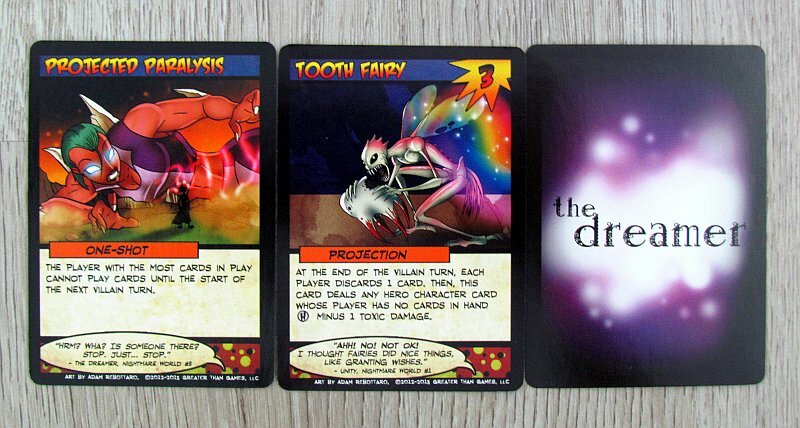 Then there is the Kismet, which brings new cards of talisman and curse. 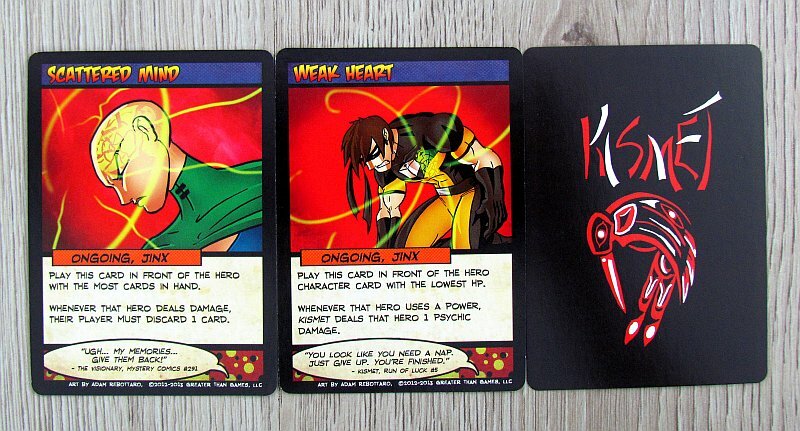 He can heal but he has no Then there is Kismet, which brings new cards of talismans and curses. She can heal, but has no helpers with her. 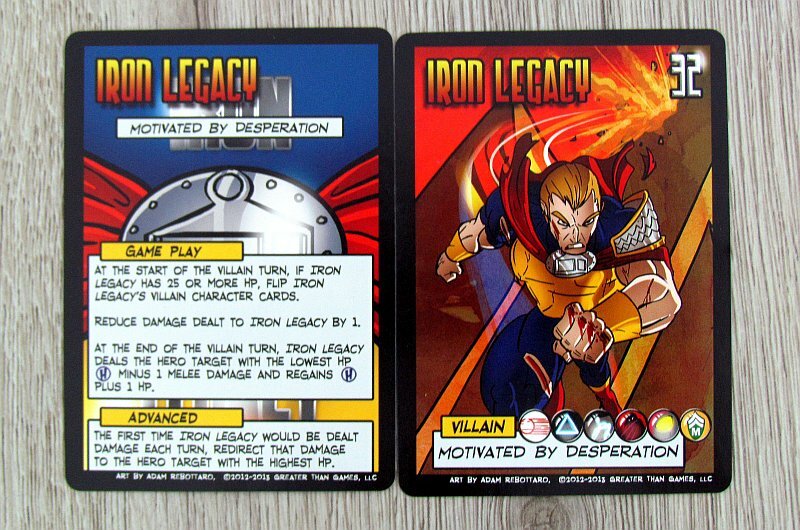 On the other hand, Iron Legacy does not seem to fit into this bad party. With golden armor, he looks like a different world, than female bad girls. He does not intimidate players, until he becomes injured. But just the armor absorbs one point from every hit. In addition, his strength means, he will give heroes hard time. Neither his deck contains any minion support. And then there’s the environment. Two packages with places, where the battle will take place. The first is The Block, full of agents and prisoners. Bars open and close, inmates are attacking heroes and bad guys, and everything encourages the imagination of the players. The other environment is a place, where time is collapsing. It’s called Time Cataclysm, and its anomalies roam its corridors. It is these two environments, that we prefer from whole narrative capabilities of the Sentinels series. 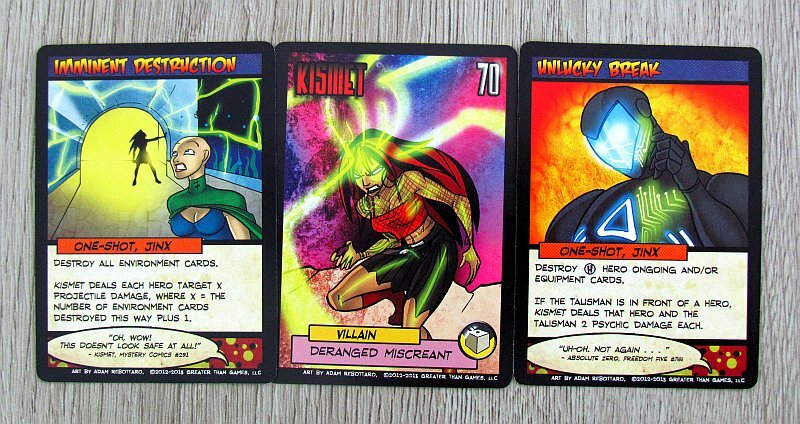 Shattered Timelines is probably the best expansion from the point of view of quality, which we have had the chance to try out for the Sentinels of the Multiverse. 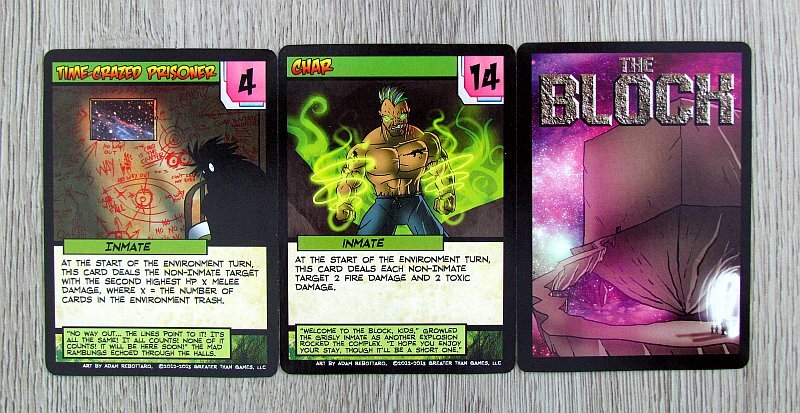 It offers great heroes and excellent bad guys, and if you are a fan of this card comic book game, then you have nothing to hesitate about. 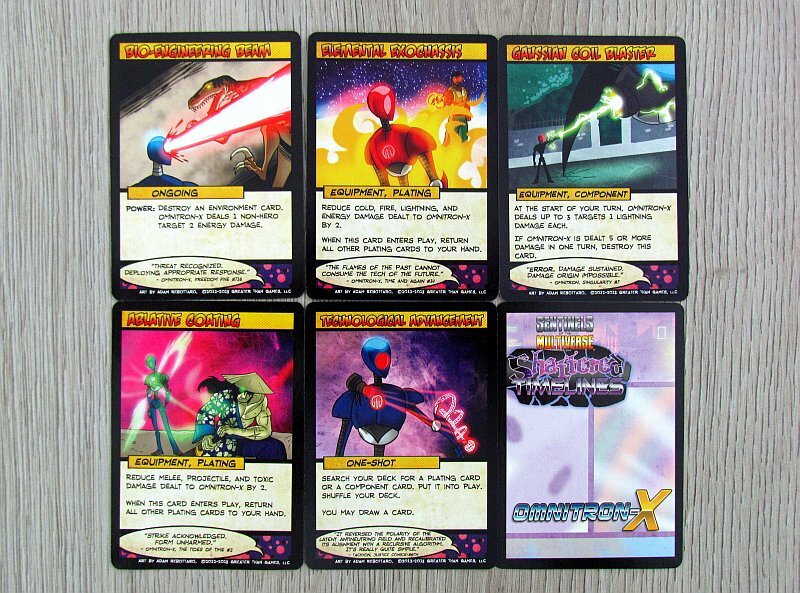 If you should have any expansion for Sentinels of the Multiverse, then it’s Shattered Timelines. 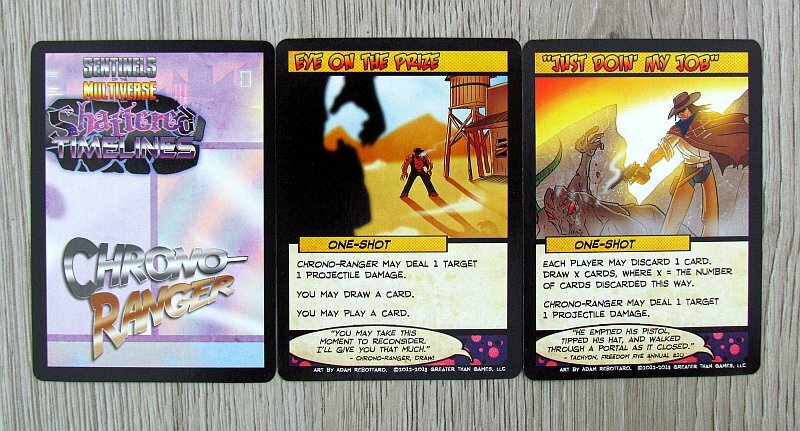 Sentinels of the Multiverse: Shattered Timelines is an expansion, that moves the possibilities of the popular game even further. Variability is re-invigorated, but this time, the quality of individual characters is really excellent. The players can look for new interesting heroes and villains, and with them a real challenge. New environments mean a lot of theme and a bit of a fancy of players. 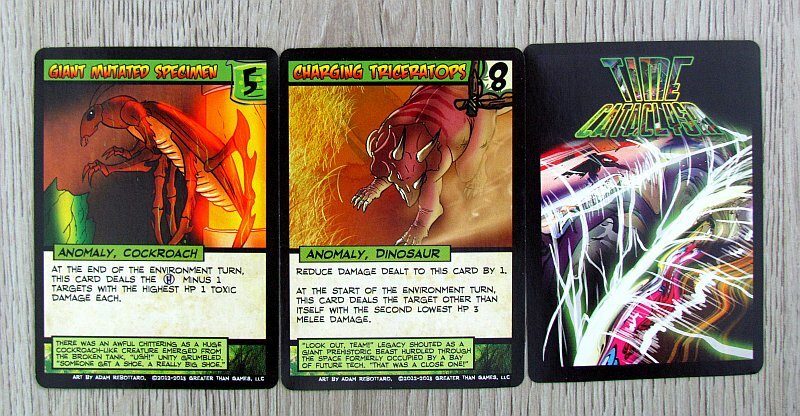 Sentinels of the Multiverse: Shattered Timelines is the best expansions for this game! Review: Coconuts – hold on to your nuts!